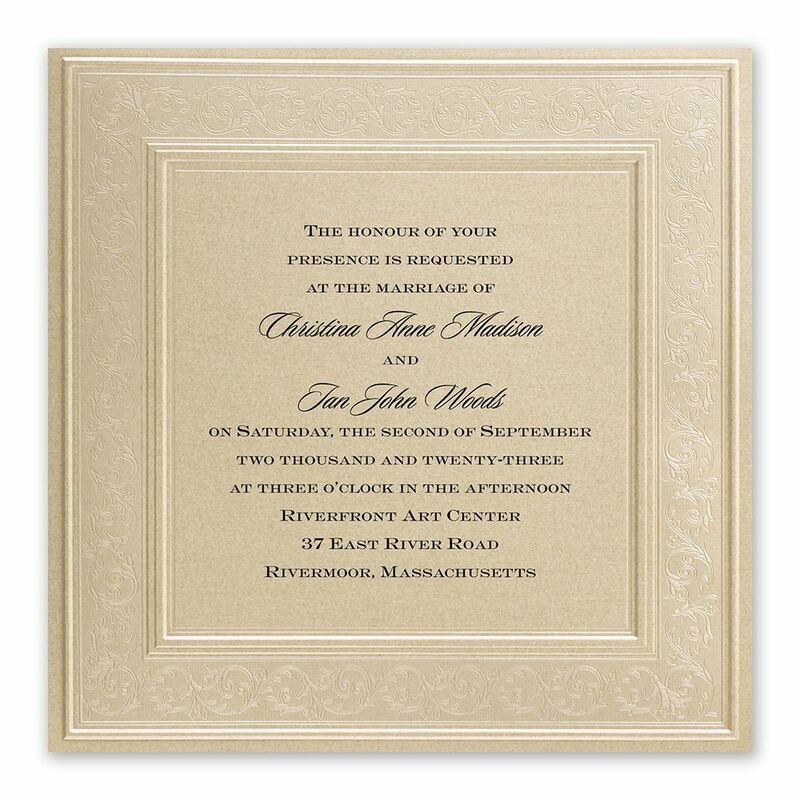 Sparkling gold paper plus a shimmering pearl border makes a brilliant statement about your wedding! Embossed panels frame your wording, which is printed in your choice of colors and fonts. Inner and outer envelopes are included. These elegant framed in luxury wedding invitations feature thermography printing. Thermography is a unique printing technique that results in raised lettering you can feel, which adds to the luxurious experience of this printed piece. Invitation is printed on 105 lb. ecru shimmer paper. Extra postage required. This invitation looks really nice. Its simple without being plain and it had an understated elegance with a formal flair. The paper, however, I felt was quite flimsy and cheap feeling. If the cardstock was a bit thicker, this invitation would be a perfect. Wedding invitations came out perfect. However I used the incorrect print style making the reply address on the envelopes illegible. Therefore I had to reorder more. Their customer service is just ok. I had to remind her of the 40% off and the $1.99 shipping offer for my re-order. They offer no accommodations or discounts if you make an error. So be sure you have EVERYTHING correct. I ordered the framed in luxury set of invitations, response cards and reception cards. The first order I placed was great. I then placed a second order to send out invites to additional guests. That order came with multiple defective invitations. Print was crooked, border was off, print was on top of the border and in some cases the ink was not solid black. It appeared faded. Contacted customer service and they only offered to resend me a new batch of invites. They did not offer to take not a penny off the $300 Id spent on poor quality invites; nothing for the inconvenience of many invites not being able to go out right now, while waiting for another batch of hopefully corrected invites. This is not the sort of thing brides should have to contend with especially for majority out of town guests!!. I was really shocked and not quite satisfied with the company. Buyer beware and thoroughly check every single item you order. I was absolutely THRILLED with my purchase. I ordered these on a Monday, they came by Thursday. I was shocked at how quickly they arrived.These invitations are timeless. They are elegant and classic. The paper is thick and velvety and the textured framing around the center is lovely. I have gotten so many compliments from friends and family regarding how beautiful they are.Keep in mind, because they are square they require extra postage. Mine required two forever stamps each. Great quality elegant looking. Received lots of compliments. Was happy with my choice of invitation style as well as the font. High quality paper and elegant design. The layout and font are lovely and I'm very happy with this purchase for my wedding invitations. Impeccable customer service. Fast shipping and wonderfully packaged. I also ordered wedding invitations from another competitor and hands down invitations by dawn was far superior. I would recommend them to all brides. I rarely write reviews but I was exceptionally pleased with this company and would like other brides to know. Beautiful Invitations! I was worried that the paper quality wouldn't be great because the price was so good but I was wrong. Quality is great! Very elegant and beautiful! I loved the cards I got exactly what i ordered. I customized it to my personal style.They where beautiful, elegant and had a vintage look which I was looking for. Best product totally recommend.